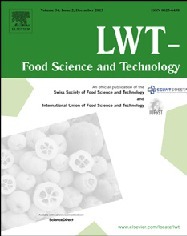 RIQUIM - Repositorio Institucional de la Facultad de Química - UdelaR | The impact of different baking conditions on the stability of the extractable polyphenols in muf fi ns enriched by strawberry, sour cherry, raspberry or black currant pomace. The impact of different baking conditions on the stability of the extractable polyphenols in muf fi ns enriched by strawberry, sour cherry, raspberry or black currant pomace. The stability of polyphenols in muffins, enriched with strawberry, black currant, raspberry and sour cherry pomace (50 g/kg), baked in a conventional and halogen oven, at three different temperatures (140, 180 and 220 C), was studied. The most unstable compounds were anthocyanins (36e97% lost), in contrast the flavonol glycosides were the most stable (0e21% lost). Over 100% recovery was observed for neochlorogenic acid and ellagic acid (95e120% and 341e823%, respectively). The increase of free ellagic acid content in muffins enriched with strawberry or raspberry was positively correlated with the baking time (r ¼ 0.879 and r ¼ 0.944, respectively) and was the result of thermal hydrolysis of ellagitannins and ellagic acid glycosides. The highest temperature combined with a short baking time had the best effect on the preservation of polyphenols, however, since the polyphenol composition can be expected to vary in different fruits, each case should be considered separately, in order to achieve the most favorable nutritional effect of baked products enriched with fruit pomace. The sensory evaluation showed that muffins enriched with 50 g/kg of fruit pomace were competitive with control muffins, with the added benefit of having a higher nutritional value. Gornás, Pawel, “The impact of different baking conditions on the stability of the extractable polyphenols in muf fi ns enriched by strawberry, sour cherry, raspberry or black currant pomace.,” RIQUIM - Repositorio Institucional de la Facultad de Química - UdelaR, accessed April 20, 2019, http://riquim.fq.edu.uy/items/show/3957.